As I’m still struggling with my energy levels, I’ve been trying to take today easy knowing we have a full-on afternoon with the boys and our evening family dinner. As I was resting in my bedroom, the first little munchkin appeared wanting to play. I managed to coax him into snuggling up and watching ‘Paw Petrol’, the most my energy levels could manage. A little later, munchkin number 2 came in and the three of us watched the heroic puppies save the day over and over. Perfect. And the longest I’ve seen them sitting nice and quietly for quite a while! Later, after our family dinner, Callum asked if we could all play Farm Yatzy, the game I’d bought him for his birthday. Although I needed to rest, how could I resist? Yahtzee has been a firm family favourite in our house for years and years. It’s our go-to game at Christmas-time and on a rainy Sunday afternoon. For the uninitiated, it’s a “seductive game of luck and strategy” and players have three rolls of the dice to rack up points in 12 scoring categories, including the elusive Yahtzee – rolling five of the same number. It’s seriously addictive and oodles of fun. 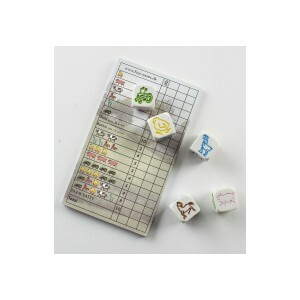 Hearing through a friend about Yahtzee for kids, I searched and searched and finally found ‘Farm Yatzy’. I honestly don’t know why they spell it differently, but it took me ages to find it!. Anyway, it has farmyard animals instead of numbers and a slightly easier scoring system. And Callum absolutely loves it. Especially as the first time we played, he scored two Yahtzee’s in one game which is incredibly rare. And it makes my heart so happy that now, every time he’s comes to our house, he wants to play it. Again. And again. It’s wonderful and so much better than him being attached to his device playing computer games. So, after dinner tonight we all sat down to play a couple of games, including his mummy and daddy. It was priceless to see the joy on Callum’s face. It was brilliant for all of us to enjoy this family fun time together, rather than all disperse to our different corners of the house, which usually includes the boys running around noisily getting up to all kinds of mischief! After a couple of games – which I’d come second and then first, just saying (as I’m usually much further down the leader board) ☺️ – I wearily climbed the stairs with a huge big smile on my face and knew it was worth using up every last ounce of my energy. So with this in mind, my happy for today is being mindful while playing Farm Yatzy with Callum and the family. What a wonderful way to spend time as a family! Love it!